Rob Kitchin, Paolo Cardullo and Cesare Di Feliciantonio have published a new Programmable City working paper (No. 41) via OSF: Citizenship, Justice and the Right to the Smart City. The paper is a modified, pre-print version of the opening chapter in the book ‘The Right to the Smart City’ edited by Paolo Cardullo, Cesare Di Feliciantonio and Rob Kitchin to be published by Emerald Publishing. This paper provides an introduction to the smart city and engages with its idea and ideals from a critical social science perspective. After setting out in brief the emergence of smart cities and current key debates, we note a number of practical, political and normative questions relating to citizenship, social justice, and the public good that warrant examination. The remainder of the paper provides an initial framing for engaging with these questions. The first section details the dominant neoliberal conception and enactment of smart cities and how this works to promote the interests of capital and state power and reshape governmentality. We then detail some of the ethical issues associated with smart city technologies and initiatives. Having set out some of the more troubling aspects of how social relations are produced within smart cities, we then examine how citizens and citizenship have been conceived and operationalised in the smart city to date. We then follow this with a discussion of social justice and the smart city. In the final section, we explore the notion of the ‘right to the smart city’ and how this might be used to recast the smart city in emancipatory and empowering ways. This entry was posted in publications and tagged citizenship, ethics, right to the city, smart cities, social justice on October 22, 2018 by Rob Kitchin. Many thanks to Rob Kitchin and Cesare di Feliciantonio for their editing suggestions and comments, and to the attendees of the ‘After the smart city? The state of critical scholarship ten years on’ sessions at the Association of American Geographers meeting in New Orleans, April 2018, for their useful observations. Abstract – The paper advances some critical reflections, and contributes to the debate, around commons and commoning in the smart city. It suggests that so-called ‘smart commons’ – that is, forms of ownership of data and digital infrastructure increasingly central to the discourse around appropriation and co-production of smart technologies – tend to focus more on the outcome (open data or free software) rather than the process which maintains and reproduces such commons. Thus, the paper makes a positional argument for a ‘smart approach’ to the commons, advocating for a central role for the public as a stakeholder in nurturing and maintaining urban commons in the smart city. The argument is illustrated through three brief case studies which reflect on instances of commons and commoning in relation to the implementation of public Internet infrastructure. This entry was posted in publications on September 4, 2018 by Paolo Cardullo. Today is the last funded day of the Progcity project. Hard to believe that is five years since we started the research. It’s been a very fruitful endeavour and has fostered some very productive collaborations between the 16 researchers who have worked on the project at some point during it’s lifetime, producing a rich array of empirical material and an extensive range of published outputs, numerous presentations, an archive of over 150 videos from our seminars and workshops, and the Dublin Dashboard. The work, of course, will not stop, with the doctoral students to submit their theses and more books and papers to be written, and we’ll continue to maintain this blog and social media. In due course we hope to archive all of the c.500 interviews we have conducted and other research material so that others can re-use and mine our data. In addition, the research helped form the basis for a new SFI-funded investigator project, Building City Dashboards. The main thing I wish to do at this point is to put some thank yous on the record. First, I would like to thank the whole Progcity team – all the doctoral students and postdoctoral researchers and Rhona, the project administrator, who kept us on the bureaucratic straight-and-narrow. It has been a real pleasure to work with and learn from you all – hopefully Progcity has contributed to positively to your future careers and will continue to do so. Also, thanks to Chris, Aphra and Leighton who have co-supervised the doctoral students and contributed to the research. Second, thanks to all the folks who took part in our fieldwork and interviews for sharing their expertise, insights and time. The kind of in-depth case studies we have been undertaking can only yield valuable ideas and knowledge through the generosity of participants and it has been really fascinating to listen to and work with you all, and learn from and translate your experiences and viewpoints. Third, thanks to all those who helped facilitate the research at different sites, especially the Smart Dublin team, who have been a tremendous help. Conducting fieldwork is always reliant on the aid and goodwill of many people and we’ve been very fortunate across all our sub-projects to receive sound advice and practical help. Fourth, thanks to all the admin staff in MUSSI, the university and the ERC who have helped us to administer the project. Running large EU-funded projects comes with a fairly sizable bureaucratic overhead and we have benefited from useful feedback and help over the life of Progcity. Fifth, I am very grateful to other researchers in the university and the broader academic community who have taken an interest in the Progcity project – attending our seminars and workshops and discussing our research at events and via email/social media. Research is always a collaborative effort of dialogue and exchange and we have been very fortunate to interact with a very generous set of scholars. Hopefully your own research, like ours, is richer from our encounters and we’ll continue to learn from each other. I am sure I have missed folks out that deserve our gratitude, so apologies if that’s the case, but rest assured your contributions have been appreciated. This entry was posted in news on May 31, 2018 by Rob Kitchin. 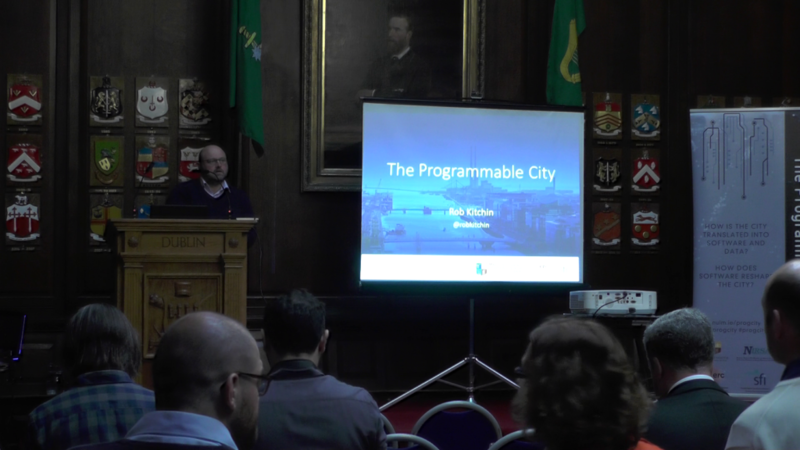 We held our dissemination event “Lessons for smart cities from the Programmable City project” on the 9th May 2018, in the Oak Room of Mansion House in Dublin. We would like to thank all of our participants who attended and everyone else as well for your interest in our project. This entry was posted in talk slides, video on May 24, 2018 by Liam Heaphy. The Programmable City project will come to a close at the end of May 2018. To mark the occasion the project is hosting a final event in the Mansion House, Dublin on May 9th, 10am-2pm. At this we will present the main findings and recommendations from across the sub-projects to stakeholders. The focus will very much be on practical lessons for smart city development. In total 16 researchers worked on the project at some point during its lifetime, mainly undertaken fieldwork in Dublin and Boston, but also other cities. A diverse range of smart city issues – open and big data, policy formulation, city standards, traffic control, testbeds, smart districts, bike share, smart energy, emergency management response, procurement by challenge, smart lighting, property development, hackathons, citizenship, work practices, governance, and ethical and security considerations – were investigated from a social, cultural, political, economic and ethical perspective through policy analysis, c. 500 interviews, and ethnographic research. In addition, part of the team built the Dublin Dashboard. A number of team members have progressed to other academic posts around the world (Australia, Belgium, Canada, England, Ireland, Taiwan, Wales) but all will be returning to Dublin to join the rest of the team to present their work through quick, snappy talks with time for questions. In addition, there will be a chance to view some of our latest dashboards work, with an AR/VR demo of 3D Dublin planning application. We invite you to join us at this event to discover what lessons smart city developments might learn from our research. This entry was posted in events and tagged lessons, smart cities, Workshop on March 28, 2018 by Rob Kitchin. This paper examines the neoliberal ideals that underpin participation and citizenship in the smart city and their replication mechanisms at European level. We examine self-proclaimed ‘citizen-focus’ projects funded by or aligned to the European Innovation Partnership for Smart Cities and Communities (EIP-SCC) by way of analysing policy documents and interviews with key stakeholders of smart city initiatives at European level and the Smart City Expo World Congress in Barcelona (SCEWC 2017). We suggest that smart cities as currently conceived enact a blueprint of neoliberal urbanism and promote a form of neoliberal citizenship. Supra-national institutions like the EIP-SCC act at a multi-scalar level, connecting diverse forms of neoliberal urbanism while promoting policy agendas and projects that perform neoliberal citizenship in the spaces of the everyday. Despite attempts to recast the smart city as ‘citizen-focused’, smart urbanism remains rooted in pragmatic, instrumental and paternalistic discourses and practices rather than those of social rights, political citizenship, and the common good. In our view, if smart cities are to become truly ‘citizen-focused’ an alternative conception of smart citizenship needs to be deployed, one that enables an effective shift of power and is rooted in rights, entitlements, community, participation, commons, and ideals beyond the market. This entry was posted in publications and tagged citizenship, European Union, neoliberalism, smart cities, smart citizens on March 12, 2018 by Rob Kitchin.